Says 2010 US Open Champion Graeme McDowell. This is not golf he tells reporters on Friday night in an interview after his second round. And the Chicago Golf Guy thinks that he may be right. Well not really right, but he definitely has a point. The golf course at Royal Lytham & St Annes has received a lot of rain in the last few days, and that rain drains into the little pot bunkers on the golf course. 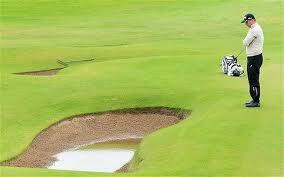 Unfortunately those bunkers are not all that little, they are super deep and they are filled with water. The problem is that if there was water collecting in the fairway the players get a drop. Players still get a drop from casual water in a bunker, but you cannot drop outside of the bunker. Here lies the problem. I’m Tom Watson…you don’t scare me. The bunkers are so deep and so little that there is no where to drop the ball outside of the casual water, and be able to play a shot. Players have to have one foot in and balance on a knee, or just hit and hope. I believe what Graeme was saying is that it is too much of a penalty to have deep fairway bunkers fill up with water where players really have no chance of getting out of them. 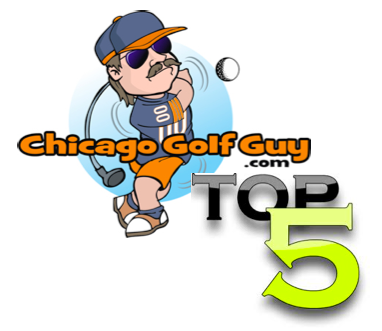 What does the Chicago Golf Guy say… don’t find yourself in those bunkers. If every player knows which bunkers are full of water, and are going to be a nightmare to get out of, then they should be smart enough to know to stay away from them. The problem with that mentality (stay away) is there are 200+ bunkers at Royal Lytham & St Annes, so staying away is far easier said than done. But this is the home of links golf, the home of golf really, and here in the land of golf history they have deep bunkers, and those bunkers are going to be a real pain for players to get out of. 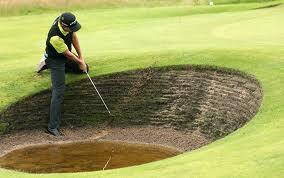 My feeling is that the Open Championship wouldn’t be the Open Championship without difficult pot bunkers that players are going to be severely penalized for finding. Taking away pot bunkers from the Open Championship, is like cutting the rough down at the US Open, or flatting the greens at The Masters. These are the best players in the world, and some of us take pleasure in their heart aches. Please R&A don’t take away our little guilty pleasures. Watching players struggle in the bunker makes some of us hackers feel better about taking a few extra shots when we find ourselves in a bunker.